It’s been over four years since I read the final novel by Stieg Larsson, The Girl Who Kicked the Hornet’s Nest, but the trilogy about the tough, mesmerising Lisbeth Salander stuck with me. There was talk that Larsson had begun work on a fourth before his death in 2004, but it appears that this is a separate story following a bitter argument between those Larsson left behind. Those who hold the rights chose David Lagercrantz to continue the series. It picks up around a year after the events of the last book where Lisbeth Salander, the tattooed, vicious hacker brought down her father’s criminal empire and the government figures who protected him. In this she was aided by investigative journalist Mikael Blomkvist, who wrote about it in his magazine Millennium earning great praise, but since the magazine, and Blomkvist, have struggled and the two have lost contact. Salander continues to chase down and break the ruins of her father’s empire which leads her to hack the NSA, searching for information on the criminals she wants. This group named the Spider Society have been hard at work in the areas of industrial espionage and computer genius Frans Balder has discovered they stole some of his work and are after his pioneering AI work. He leaves Silicon Valley and returns to Sweden where he takes custody of his autistic son, August. The Swedish government are trying to protect him while Balder debates what to do next. Meanwhile, the NSA are trying to find out who hacked them. Blomkvist is approached by an associate of Balder who tips him off to what may be an interesting story, but Blomkvist is unsure, but Balder contacts him personally and he goes to visit the scientist. Unfortunately, the Spider Society have decided to make their move and Balder is killed, the assassin sparing August, who he dismissed as “a retard”. Blomkvist starts to dig deeper and discovers the Spiders are quite ruthless and vicious, headed by a mysterious figure nicknamed Thanos after the Marvel Comics character. When August’s gift of photographic memory is discovered he could provide a clue to the killer’s identity. The Spiders decide to get rid of him, but Salander works out their plan and rushes to his aid, managing to get him to a safe place thanks to Blomkvist and his colleagues. As Salander hides out with the boy she tries to get him to draw what he saw and attempts to crack the NSA file she stole. Meanwhile, Blomkvist and the police investigate. Blomkvist makes big strides and discovers a link between Salander and Thanos, which surprised him and explains the hostility between them. What secrets were the NSA hiding and can Salander uncover them? Will Blomkvist be able to save his magazine by working out this story? And can Salander really protect the boy from an intelligent and skilled criminal gang? I must say I really enjoyed this book, which while being gritty and filled with unsavoury characters softens the brutal, sometimes overdone darkness of Larsson’s writing. Lagercrantz manages to nail a similar style, but gives more humanity to the supporting players. Salander and Blomkvist remain a decent central pair, the uncompromising, aggressive hacker and the world weary, more personable writer. They are separated for much of the work, but communicate through computer messages, and Lagercrantz shows their respect and affection through their responses to hearing from the other. The plot unfolds at a good pace and there are some tense, gripping moments. It’s a well handled thriller and introduces a new, and interesting villain. It doesn’t quite match the first book in the series but it’s a solid continuation and an entertaining read. 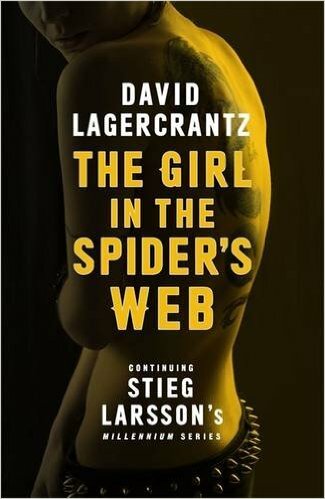 Verdict: Lagercrantz seems to hold a less bleak worldview than Larsson which results in an exciting thriller which avoids the nastiness of the previous installments. An engaging, entertaining thriller. 7/10.